xiv + 292 pp. 23 x 15 cm. Jewish mysticism can be quite a puzzle to the uninitiated. 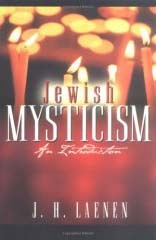 For example, does the term “mysticism” mean the same thing here as in other contexts? Also, in what sense are the various phenomena that come under this heading really “Jewish”? In a thorough historical overview of the movements and trends in Jewish mysticism, Dutch scholar J.H. Laenen takes us step by step through the centuries of development to the present day, explaining how the various currents of tradition are related. We are introduced to Hekhaloth mysticism, classical Kabbalah, Lurianic Kabbalah and the messianism of Shabbetai Zevi, as well as Hasidism, and we are given explanations of the doctrine of the sefiroth, reincarnation, language mysticism, numerology, and symbolism. Jewish Mysticism: An Introduction fills a long-standing gap in the available literature. Readers will find this accessible introduction reliably informed and authoritative. Avoiding the pitfalls common to other popular works in this fascinating field, it provides a thorough grounding in the subject and offers helpful pointers for further study. J.H. Laenen is a specialist in Jewish mysticism. Along with his qualifications in Semitic languages and cultures from the University of Leiden, he also has a degree in Spanish language and literature from the University of Utrecht in the Netherlands. Lees ook de lovende recensies van dit boek op amazon.com.